Star Island Singapore Countdown Edition in conjunction with Marina Bay Singapore Countdown. Immerse yourself in a new action-packed universe of world-class fireworks, 3D surround sound, synchronised light displays and performances this New Year’s Eve with Star Island Singapore Countdown Edition, presented for the first time out of Japan as part of the Marina Bay Singapore Countdown celebrations! 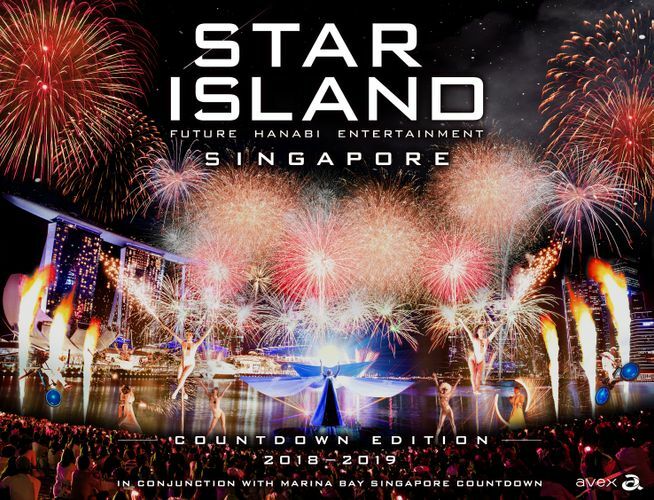 Be the first in Singapore to experience the futuristic magic of hanabi (Japanese for fireworks) entertainment at Star Island, a one-of-a-kind fireworks musical that marries larger-than-life pyrotechnics and lights, 3D sound technology and multi-disciplinary performance acts into one unforgettable night. Visitors will also find themselves immersed in the multi-sensory show with individual LED bands to add more light to the colourful celebrations. There will also be pre-show activities for the whole family, a marketplace of delectable food and delights. Don’t miss out on the most spectacular fireworks countdown event in the region! - All ticket holders will be given an LED Wrist Band upon entry to event grounds. - Early bird ends 30 November 2018.